Gorgeous printed linen in big, bold, bright prints! These heathered knits look great and perform, too. The micro-poly and Lycra blend from Under Armour wicks moisture away, making these perfect for sewing your own active wear! Treadlette Julia made this cute springy dress! This floral on a white background is so fresh and cool for warm weather. Julia used this pattern, New Look 6431, a couple years ago to make this fantastic chambray version. The neckline features a few crisp pleats for visual interest. 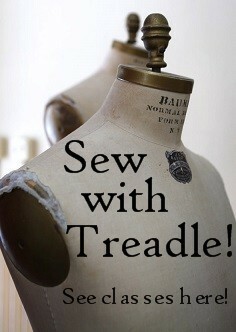 What are you sewing lately? Don't forget to share it with us! Looking for a special gift for Mother's Day? Check out this new line of jewelry at Treadle! Each unique piece features vintage buttons and other gorgeous elements. We've also got a new supply of hand-turned seam rippers! These rippers are ergonomic, easy to hold, and make ripping seams a lot more fun! And of course, we also sell gift certificates! Because sometimes the perfect gift is the one she picks herself. Michele made this cute top from one our fab printed knits. The florals and colors just radiate spring! This cute tee has the short sleeve cut in one with the body for super simple construction. Michele used New Look 6482, which comes with a few extra wardrobe options, too! A Whole New Schedule of Summer Classes! Our new summer class schedule is up! Our summer schedule is packed with fun! There are great learning opportunities covering everything from fitting and pattern work to quilting, sewing with knits, and tons of fabulous garments to make! Plus, lots of great kids classes too! 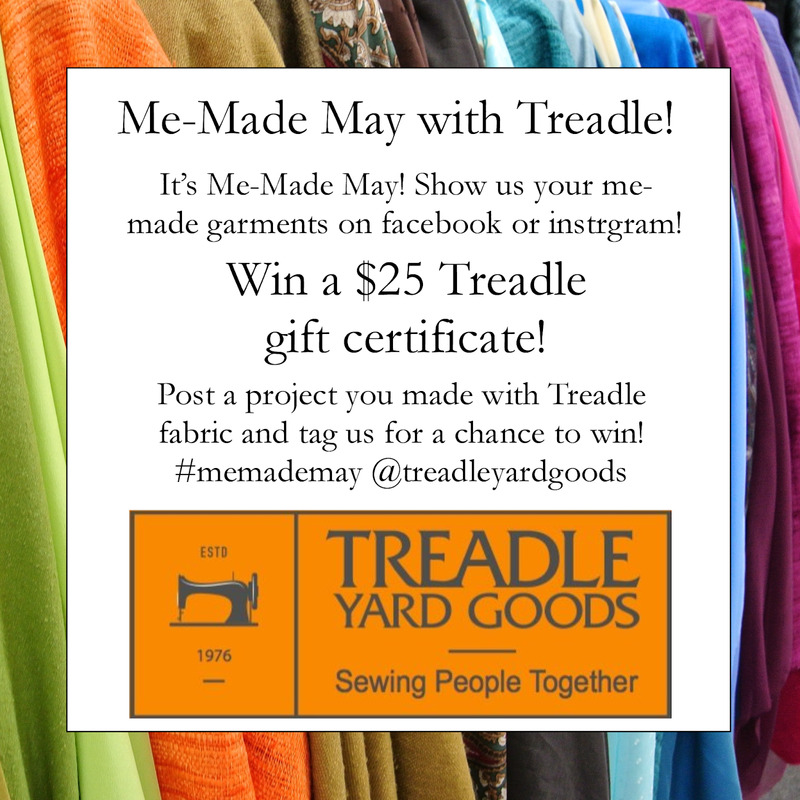 Me Made May with Treadle! Sewists everywhere are getting creative for Me-Made May! It's a whole month devoted to making and creating garments of your own. 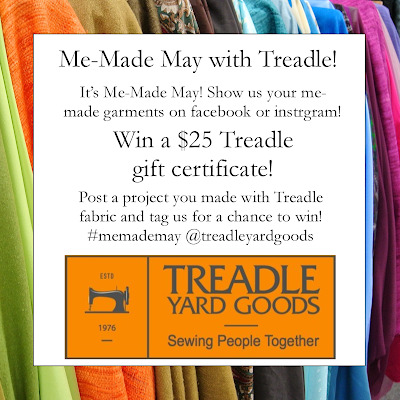 And we want to encourage you with the chance to win a $25 Treadle Gift Certificate! We'll be giving away one $25 gift certificate every week! 1.) Post your me-made garment on Facebook or Instagram. 3.) Once a week, through the month of May, a winner will be randomly selected! We'll share the winning photo on our store page. 4.) One garment = one entry. If you post multiple photos of the same garment, that still counts as one.